Syngenta introduces a new insecticide formulated specifically for early season vegetable crops that offers long-term advantages for the crop, farm workers, consumers and the environment. DURIVO is a revolutionary new crop management system that reduces pesticide use in Australia’s vegetable industry. DURIVO is applied in early season vegetable crops to provide long-lasting protection against grubs, aphids, thrips and other pests. A single treatment at planting will protect young plants for up to 40 days, eliminating the need for up to eight conventional foliar or leaf sprays. Additionally, DURIVO allows young plants to express their full genetic potential. DURIVO will become commercially available this spring following its recent clearance by the regulatory body, the Australian Pesticides and Veterinary Medicines Authority. Darling Downs vegetable producer, Westview Gardens is one of the very first farms in Australia to benefit from DURIVO. 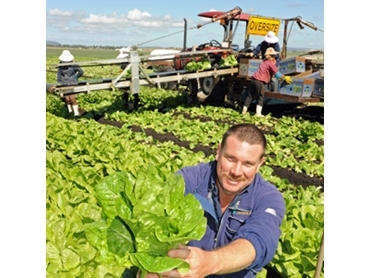 The 140-hectare farm located outside Toowoomba supplies iceberg and cos lettuce, celery as well as cauliflower to the Brisbane Markets. Agronomist Andrew Millers is impressed with the results of a pre-registration trial conducted in a crop of iceberg lettuce last summer. Andrew says DURIVO will prompt significant changes to his crop protection program. He says that their existing program for iceberg lettuce involved application of Avatar for heliothis early in the crop during summer and then a rotation of PROCLAIM and Belt. Additionally, Confidor was being used as a seedling drench for aphids. He concludes by saying that DURIVO will be replacing Avatar and Confidor, allowing them to reduce insecticide application in the farm.